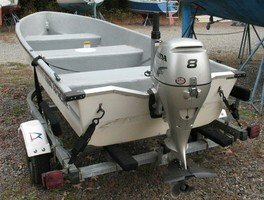 Why Get Electric Start in a Small Outboard? An electric start outboard engine on this little rig? Yeah, I'll take it. 1. How many times has the grip popped through your fingers, as you yanked on the cord? (A dozen or so). 2. How many times have you elbowed a friend or family member, who forgot to get out of the way when you were starting up? (At least three times, once in the nose). 3. How many times have you hurt your back or shoulder, when a finicky engine required five, 10, or even 20 pulls? (So many times I can’t remember). 5. How many times have you lost your balance while yanking, then fallen backwards off the boat and into the water? (Mercifully, only once – and that was decades ago). In truth, I didn’t eat my pride and buy an electric start engine on purpose. It just happened that the engine I bought had an electric starter on it. But after using it for a while I’ll never look back. Because in this case, I’m happy to accept the name “wimp”. An electric start outboard engine on this little rig? Yeah, I’ll take it.